A few days ago, I got a call from the public library informing me that a book I’d put on hold had become available. I’d completely forgotten what book it was, but the timing couldn’t have been better. Eric Weiner‘s book The Geography of Bliss: One Grump’s Search for the Happiest Places in the World reached me at the beginning of a new year, at a time when I’ve been thinking about my own life and happiness quite a bit. I’d discovered the book after reading about it on my Icelandic friend Alda’s blog. Weiner, a correspondent for National Public Radio, had visited Iceland and met with her in his research. As it turns out, Icelanders regularly score highly on surveys of the happiest people in the world, despite their isolation, unforgiving climate, and the fact that they spend most of the winter in perpetual darkness. Hopefully, the economic meltdown won’t dampen their spirits too much. 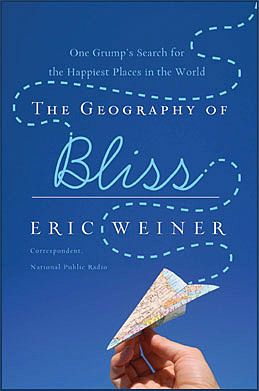 But it fascinated me, Weiner’s quest to find the world’s happiest people. He traverses the globe, writing chapters about specific countries/cultures, both happy and unhappy, to see how happiness is defined elsewhere and how it is pursued. Though he’s a self-professed “grump,” he’s also a very entertaining writer and someone I wouldn’t mind sharing a beer with. But that’s hardly surprising, since over the years, I’ve always seemed to attract friends who seemed less happy than I did. Which is to say that I’ve always considered myself generally a very happy person (perhaps an 8 out of 10). The thing that has me thinking about happiness so much lately is that over the past year or so, I think I’ve dropped to about a 7 (or even a 6 some weeks). Now this could be the dreaded “mid-life crisis” but I want to understand it a little more. It turns out Weiner is around my age, so I find his questions similar to my own. I burned through 90% of the book yesterday and hope to finish it today. In addition to being a highly entertaining travelogue (he visits Iceland, Bhutan, and Moldova, among other places), the book is a very honest and personal quest to understand happiness, if not to seek it out directly. Weiner provides a good overview of the relatively new field of “happiness studies” (or positive psychology as it’s more formally known). Instead of simply trying to understand damaged psyches, why not try to find out what makes a healthy one so healthy? A quick peek at Amazon tells me that books about happiness are all the rage right now, but what I liked about this one is the author’s wanderlust and desire to find out what makes particular cultures happier than others. I think he hits it on the head when he says that it’s our relationships with other people that ultimately determine our happiness, and that sometimes you have to remove yourself from your own culture (by comparing it with others) to understand it better. I’ll surely have more thoughts after I’ve finished the book, but I can give The Geography of Bliss my heartiest (happiest?) endorsement.